Diamond Lace Wrap is an original PlanetJune Accessories crochet pattern by June Gilbank. 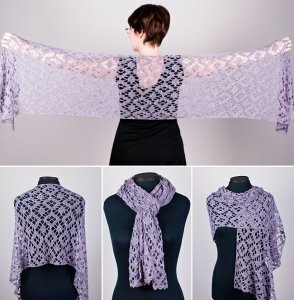 Wear this lovely wrap as a rectangular shawl to show off the stunning diamond pattern to the full, or as a lacy scarf. Choose your favourite solid or semi-solid colour and watch the alternating solid and lacy diamonds appear as you crochet. The pattern includes full instructions to make a shawl as deep as you want, or whip up a narrower scarf/wrap in a fraction of the time with equally eye-catching results! Size: Pattern includes instructions for resizing the length and width of the shawl. Finished shawl sample measures 56” x 15” unblocked; 69” x 17.5” blocked. Finished scarf sample measures 56" x 8.5" unblocked; 67" x 10.5" blocked.